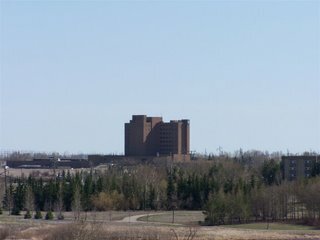 The Plains Hospital. Or it was. I remember being there as a kid, and as a teenager... It's also where my paternal grandfather was being brought to, from 2 1/2 hours away, when he died. It's not a hospital anymore, however. Now it is SIAST, a technical college. It was converted a few years ago. It was the newest, best hospital at the time, but it was on the edge of town, on an edge that never grew, so basically it was in the middle of nowhere. So... closed!